The original factory Elevation Lock Knob on LPL 4x5 enlargers is secured on the shaft by a small D-shaped spring clip. With heavy use, the plastic collar holding the clip wears or splits, at which point the knob turns with no effect. For school and institutional situations in which the enlargers get heavy use and this problem may reoccur, we have this heavy-duty replacement knob. 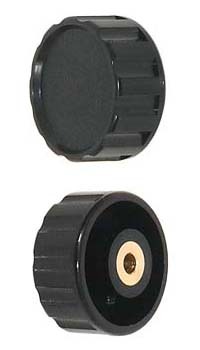 The heavy-duty knob has a brass insert and is secured to the shaft by a set screw. For less demanding situations, we also stock the original standard knob - please see Related Products below.